Pimlico Plumbers – is it a game changer? 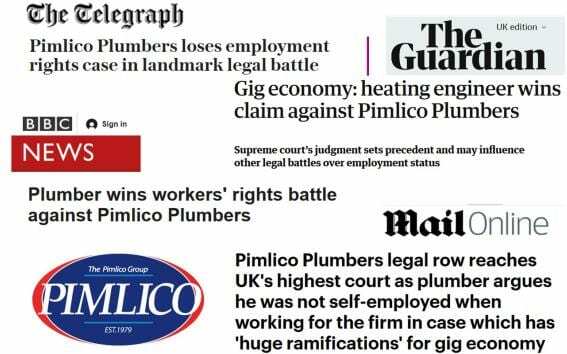 On 13 June the Supreme Court announced its long-awaited judgment in the Pimlico Plumbers case, and the decision received a huge amount of coverage, with the media describing it as a ‘landmark’ case, especially for the gig economy. Are they right that the case could have far-reaching implications for business? Any Supreme Court decision is of course legally binding on all the courts and Tribunals below, and so it is important to pay attention to what they have to say. However, I am far from convinced that the judgment is as significant as the media would have us believe. Our previous article on the Court of Appeal’s decision in the case earlier this year can be found here. The case concerned Mr Smith, who had worked for Pimlico Plumbers for nearly 6 years. He was engaged on a self-employed basis and had registered himself as such with HMRC, as well as registering for VAT. He rented a van from the company, was required to wear their uniform, and worked a 40 hour week for them. When he had a heart attack in 2011 and tried to reduce his working hours, the company refused, and he brought claims against them for unfair dismissal, wrongful dismissal, holiday pay, unlawful deductions from wages and disability discrimination. In order to pursue claims for unfair or wrongful dismissal in an Employment Tribunal, an individual has to have been an employee. Mr Smith did not succeed in showing employment status. However, for his other claims he only had to show ‘worker’ status, and this was upheld through each stage of the case, including by the Supreme Court. In the Pimlico case, the Supreme Court scrutinised the terms of the agreement between Mr Smith and Pimlico, and also the way that the arrangement operated in practice. The judgment focused on two main areas: personal service, and whether the company could be seen as his client or customer. In considering the question of personal service, they found that Mr Smith was not necessarily required to carry out the work personally, but his right to send someone to do the work on his behalf was limited to other Pimlico plumbers. They concluded that this was not sufficient to negate the fact that the “dominant feature” of Mr Smith’s contract with Pimlico was an obligation of personal performance. Factors such as the requirement for him to wear the uniform, be tracked in his company van and carry the company ID card all strongly suggested that he had to fulfil the contract personally. As to whether Pimlico could be seen as Mr Smith’s client or customer, the Supreme Court found that although the contract stated that there was no obligation on Pimlico to offer work or on Mr Smith to accept, in practice if the company did have work to offer to Mr Smith then they were obliged to do so. Therefore the Employment Tribunal was entitled to conclude that Mr Smith was a worker rather than Pimlico being his client or customer. So bearing all that in mind, why is it my feeling that the case isn’t a “landmark decision”? There are two main reasons: (a) because the case did not really establish anything that we didn’t already know, but also (b) because cases like these can only be decided on their own particular facts. Looking at (a), there has been a clear ‘direction of travel’ in all of the recent employment status cases, as we have covered in our previous articles, and many commentators were surprised that the Supreme Court even agreed to hear the appeal, bearing in mind how clear the issues were made in the Court of Appeal’s decision. It was highly unlikely that the Supreme Court would have gone against the tide. In terms of (b), a case like this can only be decided based on the particular circumstances, which includes things like the specific wording of the agreement between the parties as well as the witness evidence. No other case will have the same set of facts, so it will be relatively unusual for direct lessons to be learned. I think the main point to take from the Pimlico case (and the other recent employment status cases such as Uber) is how willing the courts are to find worker status in appropriate circumstances. Ironically, it seems that where the case could be most significant is in a non-legal sense. Because it has been so widely reported, it has shone a spotlight onto employment status issues, and we have already had a number of enquiries from employers and employees about where they stand. Now is a very good time to get a ‘health check’ on any self-employed arrangements, so as to assess the risk that they may actually have worker status. We are happy to help with that – do get in touch. https://www.pureemploymentlaw.co.uk/wp-content/uploads/2019/02/Pimlico-Plumbers-headlines2.jpg 354 567 Nicola Brown https://www.pureemploymentlaw.co.uk/wp-content/uploads/2019/02/Pure-Employment-Law-logo.jpg Nicola Brown2018-06-28 12:27:522019-02-06 17:06:44Pimlico Plumbers – is it a game changer?